Created by world-renowned designer and planner Andres Duany as a New Urbanist community. Aldea has 205 acres of perpetual open space and boasts extensive walking trails multiple picturesque parks and a children’s’ park. 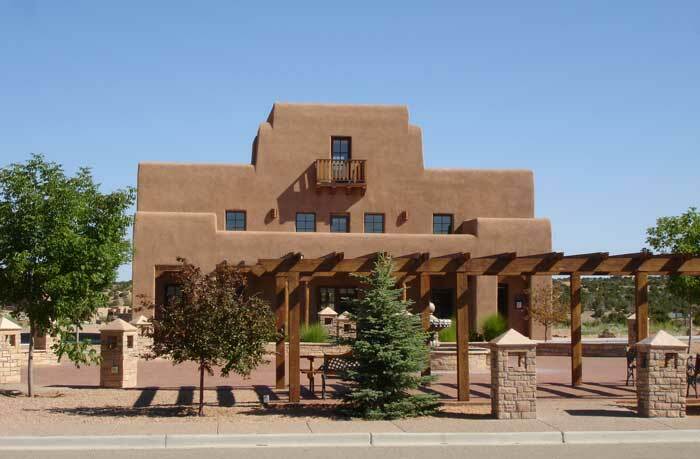 Aldea de Santa Fe has a homeowners association that is governed by a board of directors that provides strategic community leadership, architectural control, covenant enforcement, community events, accounting and finance, operation and maintenance of recreation facilities. A full-time on-site manager from Associa/Canyon Gate assists the board in the performance of day-to-day community operations. Aldea is built around a central plaza and the Community Center Building that houses the Homeowners Association offices, meeting rooms and a small fitness area. The community center is available for community meetings, neighborhood gatherings, exercise classes and conferences. The Village Center Association , which is separate from the Homeowners Association, governs the plaza and the Aldea commercial entities. As Aldea Plaza grows, it is designed to provide convenient commercial and retail services. Walk through our Community Center building.